In the centre is Our Lord in glory, dressed in priestly robes, crowned, and with rays of glory surrounding Him. His feel rest on the clouds. Below, at the bottom of the window are the "waves of this troublesome world" out of which rises a rock. typifying Mount Zion (The Revelation ch.14:1) From the base of the rock flow living waters. on the top grow corn and healing herbs, and there stands an altar crowned by the Lamb. Hanging over the altar are the Seven Seals of The Revelation, typifying those who have been redeemed by the Lamb. On the left of the central figure is St Mark, the patron saint of the Church, with pen and book, showing that he was an evangelist. and on the right, St Peter, bearing the key and a fish. According to a very early tradition St Peter supplied St Mark with the materials for his gospel. In 1834 James Powell (1774–1840), a London wine merchant and entrepreneur, purchased the Whitefriars Glass Company, a small glassworks off Fleet Street in London, believed to have been established in 1680. Powell and his sons were newcomers to glass making, but soon acquired the necessary expertise. They experimented and developed new techniques, devoting a large part of their production to the creating of church stained glass windows. The firm acquired a large number of patents for their new ideas and became world leaders in their field, business being boosted by the building of hundreds of new churches during the Victorian era. While Powells manufactured stained glass windows, they also provided glass to other stained glass firms. A major product of the factory was decorative quarry glass which was mass-produced by moulding and printing, rather than hand-cutting and painting. This product could be used in church windows as a cheap substitute for stained glass. 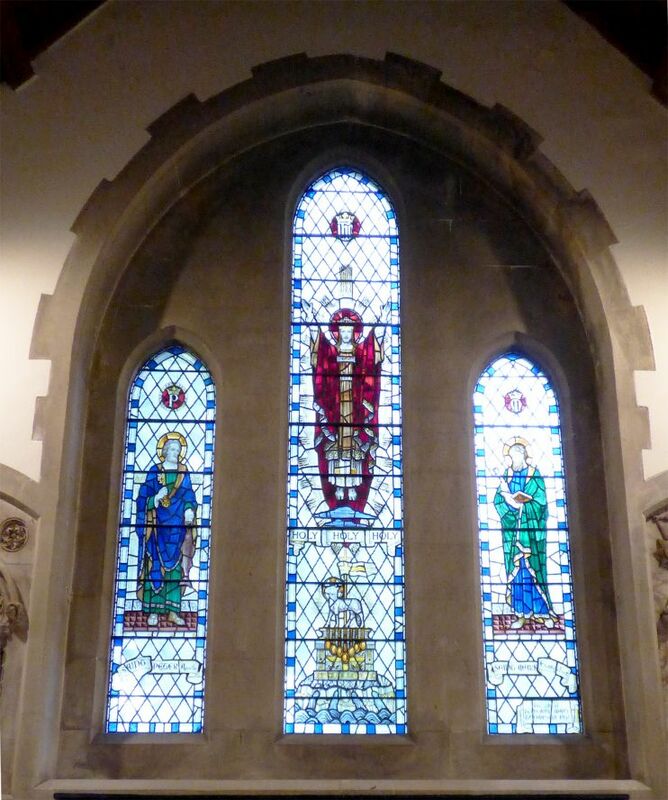 It was often installed in new churches, to be later replaced by pictorial windows. Most of this quarry glass was clear, printed in black and detailed in bright yellow silver stain. Occasionally the quarries were produced in red, blue or pink glass, but these are rare. Surprisingly few entire windows of Powell quarries are to be seen in English churches, although they survive in little-seen locations such as vestries, ringing chambers and behind pipe organs. St Philip's Church, Sydney, retains a full set of Powell quarry windows. Powell also produced many windows in which pictorial mandorlas or roundels are set against a background of quarries. During the latter part of the 1800s the firm formed a close association with leading architects and designers such as T G Jackson, Edward Burne Jones, William De Morgan and James Doyle. Whitefriars produced the glass that Philip Webb used in his designs for William Morris. The firm’s production diversified in the 1850s to include domestic table glass after supplying the glassware for William Morris's Red House. New production lines such as opalescent glass proved to be extremely successful. The firm took part in major exhibitions around the world. Designs were copied from historical Venetian and Roman glass found in European museums and art galleries. Harry Powell, an admirer of Ruskin delivered numerous lectures on glass manufacture. Whitefriars Studios closed in 1980 after 300 years of continuous production. The extensive knowledge of traditional craftsmanship were taken over by Chapel Studios founded in 1973 by Alfred Fisher and Peter Archer. If you look carefully near the bottom left hand corner of the right hand light there is an image of a white friar to be found.